A very elegant silver plated muffeneer/sugar caster stamped on the inside rim of the base “REGIS PLATE REGD MADE IN ENGLAND N1000”. The designation “Regis plate” was used by the Birmingham firm of William Suckling who occupied premises, in succession, at 40 Tenby St., 35 Albion St. and finally at No. 5 Pope St. in Birmingham. The firm was founded in 1895 and closed in 1965. The shaker is in great condition and measures approx. 7 ¼” inches high. Circa 1930’s. 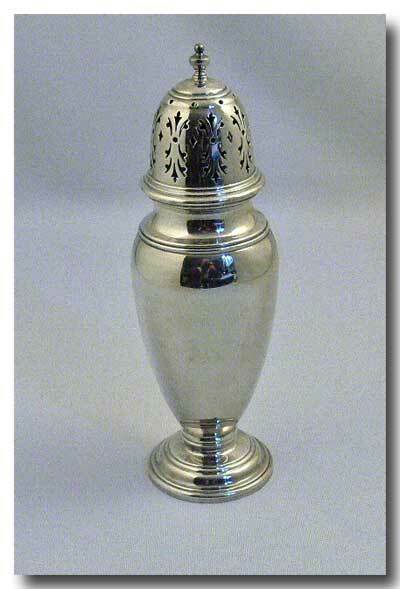 The shaker is in great condition with no silver loss.